Sun, Feb 10, 2019, 11:46 pm SL Time, ColomboPage News Desk, Sri Lanka. 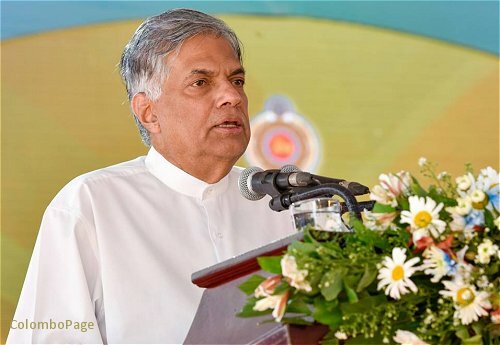 Feb 10, Colombo: Sri Lanka's Prime Minister Ranil Wickremesinghe says bankrupt politicians are spreading falsehoods claiming that the new Constitution will harm Buddhism and divide the country but those attempts cannot change the path of the government. Speaking at an event held Sunday to declare open the new building complex of the Balapitiya Divisional Secretariat, Prime Minister Wickremesinghe said there is no new constitution or even a draft has been prepared yet. The Prime Minister noted that all related parties have reached a common stance that Buddhism should be given the foremost place while maintaining the unitary status of the country. He said discussions have been held on strengthening the right to follow other religions. All parties are in agreement on the unitary status of the country, which could not be reached for the past 70 years. The Premier said discussions will be held on devolving power without harming the unitary nature. He added that the support of all factions is important when compiling a new Constitution. Otherwise, efforts to compile a new Constitution cannot continue, he emphasized. The Prime Minister further noted that nothing can be introduced even a draft until the issues related to the election system are solved because all political parties depend on that. Speaking about the region, Prime Minister Wickremesinghe said the Southern province will be transformed into the best tourism hotspot in South Asia with establishing new tourism zones in identified areas of the province. Also, new tourist hotels are under construction to cater to an increase in visitors through the Southern Expressway. The Prime Minister urged all local government representatives in the South to support the government's endeavor. The Prime Minister opened the new four-storey building for the Balapitiya Divisional Secretariat. The building with all facilities to provide an efficient service to the public was constructed at a cost of 74.8 million rupees. After opening the building, Prime Minister Ranil Wickremesinghe made an observation tour of the premises. Ministers, Vajira Abeywardena and Gayantha Karunathilaka were present on the occasion.